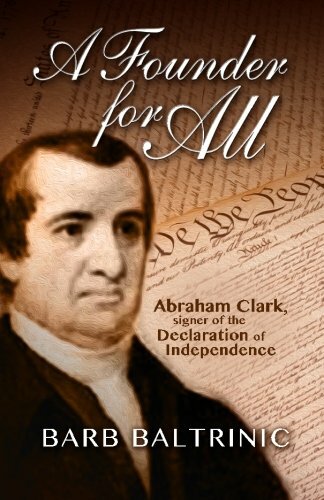 Abraham Clark was a signer of the Declaration of Independence. After spending years in the Continental Congress, he played a supporting role in the creation of the United States Constitution. Abraham Clark grew up on a small farm in Elizabethtown, New Jersey. Understanding that farm work was not his specialty, and noticing his grasp of mathematics, Abraham’s father apprenticed him to a surveyor. Clark excelled in this career and additionally learned a great deal of the law. Clark was a very popular young man who earned the trust and friendship of his neighbors by offering legal advice, for free if the person was poor. Because of his intelligence and charity, his constituents elected him to the New Jersey Provincial Congress. When Richard Henry Lee submitted a resolution in the Continental Congress to separate from Great Britain, the American Revolution was irreversible. New Jersey’s representatives in Congress (all of whom were firmly against independence) were recalled. New delegates were sent in their place. Among these men was Abraham Clark. Clark had been an early advocate for independence. Unlike most of his contemporaries, he believed separation would be beneficial for the common man. He was one of the few politicians who actively tried to improve the lives of regular people. Clark arrived with the other delegates in time to vote his approval of the Declaration of Independence. He signed that instrument and continued to serve in the Continental Congress off and on for the next dozen years. Two of Clark’s children served in the Continental Army. At a certain point, one of the young men was captured and imprisoned in the infamous prison ship Jersey. Clark did not want to use his prestigious position to influence the treatment of his sons. However, when one was put in a dungeon on the Jersey (being fed bits of food through a keyhole), Abraham had to step in. Clark mentioned the problem to his fellow Congressmen and word was sent to the British...treat that man better or we will do worse to one of yours. Fortunately, the ploy worked. Abraham’s son remained in prison but his treatment drastically improved. In 1786, Abraham Clark attended the Annapolis Convention. According to James Madison, Clark was the one who recommended setting up a second meeting to create an entirely new government. If Madison is to be believe, the United States Constitution was, in effect, Abraham Clark’s idea. Clark was appointed to attend the Constitutional Convention, however, he fell ill and was unable to attend that legendary meeting. When the Constitution was published, Clark was not happy. He felt the new federal government made many assumptions regarding individual rights. After receiving election to the State Ratifying Convention, Clark supported the new government despite his reservations. He would be relieved when the Bill of Rights resolved his issues four years later. Clark’s vocal resistance to the Constitution did not win him support to play a role in the inaugural meeting of the new government. He was not elected to any position during the first two years of the Washington Administration. Over time, however, cooler heads prevailed and New Jersey chose Abraham Clark to speak for them in the Second and Third Sessions of the House of Representatives. He passed away within days of his second term’s expiration. Believe it or not, Abraham Clark has a few biographies of his life. The only one I can speak for is 'A Founder for All.' This book discusses a Founder who was present for a number of major moments in the American Revolution but never really took off in the lore of United States history. If you cannot find it at the library, pick it up through our affiliate link below. Kindle Unlimited subscribers can read it for free. Of course, if you are not on our email list yet you should subscribe now for a new article every morning.